To demystify the financial aid process and help families find colleges they can afford. When students and parents start the college search process, they are confronted with an enormous amount of confusing information about college costs, grants, loans, scholarships and the overall financial aid application process. The way that colleges set their price for individual families is not at all transparent and the process of figuring out which colleges are affordable can be quite overwhelming. Having advised families for decades, we know how frustrating and exhausting it can be to find resources that are helpful, understandable and trustworthy. Reviewing all the available resources has been an exhausting process for us – and we are experts in the field! So, after spending hundreds and hundreds of hours combing the internet; reviewing college financial aid web sites; reading blogs & articles; watching videos; and reviewing many online tools and related services – we set out to create a comprehensive resource that is user-friendly, understandable and trustworthy. When creating Access Applied we have worked hard to avoid the problems we observed when reviewing the available resources and content. “Financialaidspeak” is a jumble of acronyms and jargon. While college financial aid officers speak it fluently, it is often incomprehensible to parents and students. At Access Applied, we have worked hard to translate as much of the jargon possible into plain English and to present information in a way that is understandable and helpful. Most of our written content is presented in a user-friendly Q & A and in many places we provide understandable step by step guidelines. Problem #2 – Much of the information out of date. Financial aid policies, procedures, requirements and deadlines change all the time. There are many players in this game, including the federal government, state governments, colleges, universities and more. There is a huge amount of information to track and keep up to date. Unfortunately, many websites that provide information about college costs & financial aid are updated infrequently – or not at all. At Access Applied, staying on top of all the relevant information is our full-time job. Everything is current and accurate; the deadlines are updated on a regular basis and the links are checked frequently. Problem #3 – A surprising amount of information is misleading or inaccurate. The subject matter is complex and ever changing. There are thousands of people writing on these topics, many of whom have only a basic understanding of the issues. Our experts have decades of relevant experience and understand all the complexity and nuance, allowing us to provide advice that is timely and accurate. At Access Applied, we only collect a small amount information to facilitate initial registration and to provide basic customer service. Because we do not collect ANY other personal or financial information, our users are in control of the security and privacy of their information. This is one reason we provide worksheets that download directly to the user desktop instead of offering database tools that capture and store data. Whenever you download and complete a worksheet, all information remains on your personal computer. It never resides on the Access Applied site. We also do not sell any products and services beyond the basic license to use this site. We will never share user contact information with any third party. You will never see any advertising on Access Applied. Although we do link to some other websites – or to specific pages within websites – which we believe you will find helpful, we do not collect any fees from these websites. We have simply determined that these links are helpful and have linked to them for your convenience. Your feedback is important to us. If you find anything on our site that you feel is inaccurate, out of date or hard to understand, please let us know immediately. 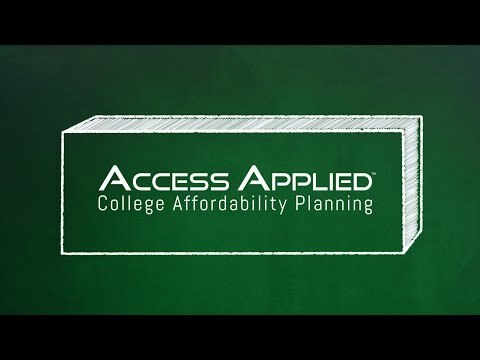 There is something for everyone on Access Applied. We recognize that there is an enormous amount of content on this site. Figuring out how to find affordable colleges, how to navigate the financial aid application process and how to pay the college bills is a big undertaking.